Delicious, elegant and healthy! The perfect ending for your Mother’s Day celebration or any special occasion! Blending a homemade meringue with farmer’s cheese gives this delicious dessert the look and creamy texture of a traditional cheesecake — but with less calories and fat. Preheat oven to 325°F (160°C). For crust, lightly spray sides of Springform Pan with nonstick cooking spray. Line sides of pan with two 2 1/2 x 13 1/2-in. (6 x 34-cm) pieces of Parchment Paper. Combine cookie crumbs and butter in Classic Batter Bowl; stir until combined. Press crumb mixture onto bottom and slightly up sides of pan. Bake 12-14 minutes or until crust is slightly browned. Remove pan from oven to Stackable Cooling Rack. For filling, place cheese in food processor; process until smooth. Using Microplane® Adjustable Fine Grater, zest orange to measure 1 tbsp (15 mL). In Stainless (6-qt./6-L) Mixing Bowl, combine zest, 1/2 cup (125 mL) of the sugar, flour, egg yolks, milk and extract. Beat on medium speed of electric hand mixer until smooth. Beat in cheese until smooth and creamy; set aside. In Stainless (4-qt./4-L) Mixing Bowl and using clean beaters, beat egg whites on high speed until soft peaks form. While continuously beating, gradually add remaining 1/4 cup (50 mL) sugar in a very slow, steady stream. Continue beating 3-4 minutes or until sugar is dissolved, meringue is glossy and stiff peaks form. Stir one-fourth of the meringue into cheese mixture using Small Mix ‘N Scraper®; gently fold in remaining meringue. Pour filling over crust. Bake 45-50 minutes or until center is set when gently shaken and top is very light golden brown. Remove pan from oven to cooling rack; cool 10 minutes. Remove collar and parchment from pan. Replace collar; cool completely, about 3 hours. Refrigerate 4 hours or overnight. When ready to serve, slice strawberries using Egg Slicer Plus®. 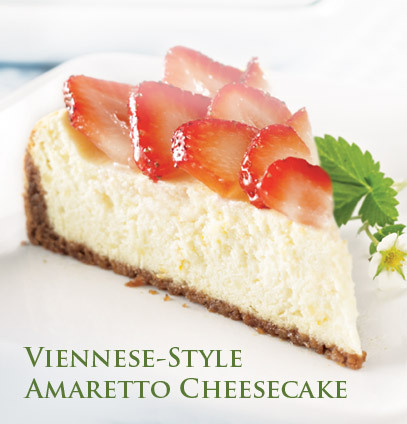 Top cheesecake with strawberries and brush with honey using Chef’s Silicone Basting Brush. Cook’s Tips: Amaretti cookies are traditional Italian cookies that can be found in the cookie section of most grocery stores. Farmer’s cheese is a fresh white cheese that is often sold in a firm, solid loaf. It has a slightly tangy flavor. Look for cheese that has 1.5 g fat in 2 tbsp (30 mL). For best results, top the cheesecake with strawberries just before serving. This entry was posted in Pampered Chef, Recipes, Recipes - Desserts and tagged cheesecake, Cook, Egg yolk, Flour, Meringue, mother's day, Pampered Chef, Parchment paper (baking), Springform Pan, Tablespoon by tiannafonz. Bookmark the permalink. Delicious, what a beautiful cheesecake.